Be in control with what info your apps have from your phone. Privacy is possible but it will take a little work. 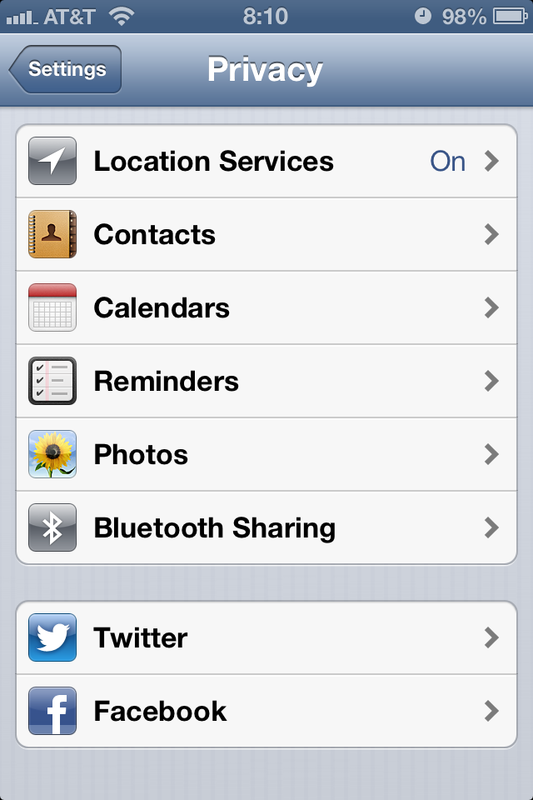 This tutorial only covers iOS 6, since those are the devices that I have. If anyone could help out with Android instructions, that would be great. 2. If you enable the feature, your last 20 photographs and every subsequent photo you take, will be automatically uploaded in the background to a private Facebook album. So you may want to check what photos you have already taken first. 6. 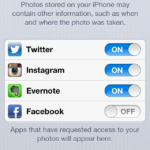 Automatic uploading of every photo you take means every photo you take. Yes, including the ones you took for that guy you’re flirting with, or the one you snapped of that part of your body you can’t quite see properly with a mirror. Furthermore, if someone takes a photograph of you without your permission it will be automatically uploaded to Facebook – you may demand that they delete the photo off their phone, but will it also have been removed from their private Facebook album? 7. 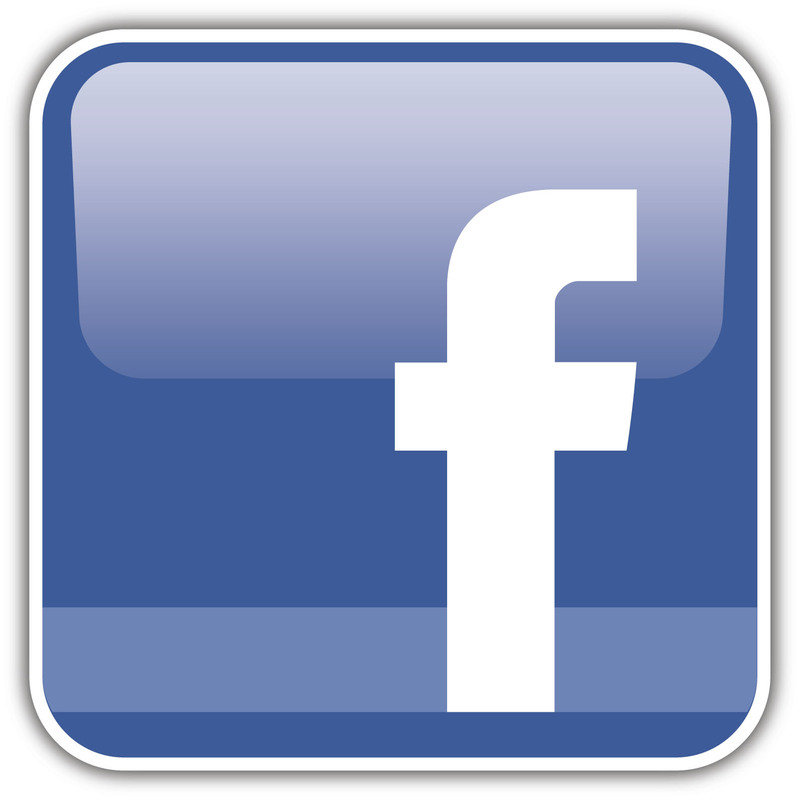 Every photograph synced from your phone will be able to be mined for information by Facebook. Photos taken on mobile devices can include meta data such as the location where the photo was taken – and this could be used to determine where you are, and help Facebook display localised advertising. Furthermore, Facebook could integrate its facial recognition technology with Photo Sync, analyse your photos to see whose faces it recognises and automatically tag their names. Over time a comprehensive database of where you have been, and who with, is built up. 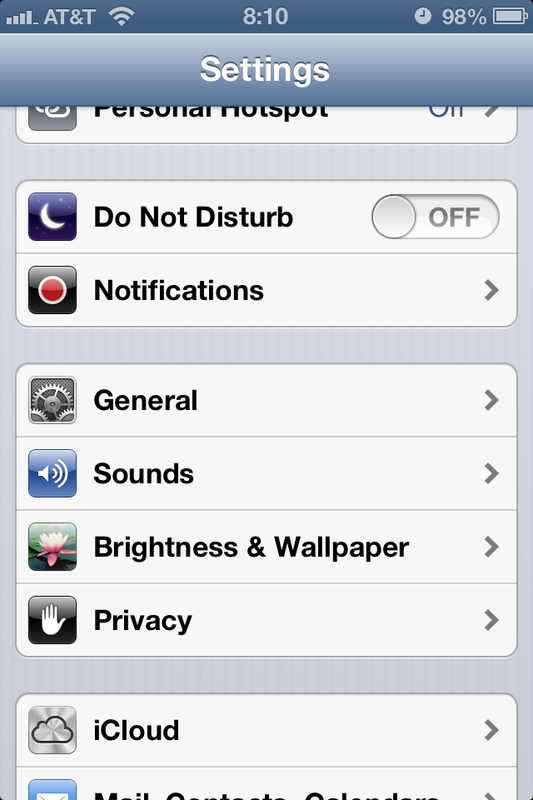 On your iOS 6 device, tap Settings and scroll down (up?) to Privacy. It’s in the third grouping, right below General and Sounds. 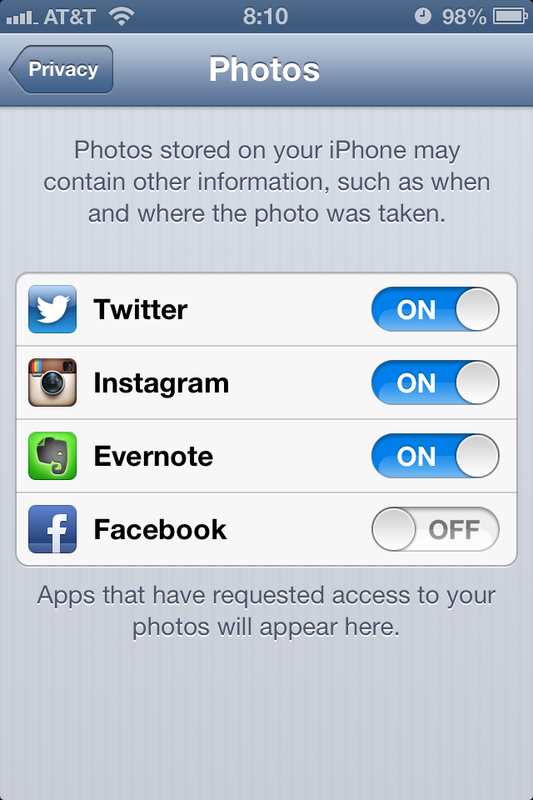 Once you’re in the Privacy menu, tap Photos. It should be the penultimate item in the first grouping. Finally, move the slider for Facebook from ON to OFF. Facebook will no longer be able to access your photos. Online privacy takes a little creativity and a lot of knowledge. Sometimes, being proactive is the best thing to be. 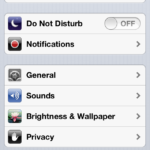 …in which we make the obligatory iOS 6 initial thoughts post. To nobody’s surprise, Apple (at its WWDC keynote address) formally announced the next major edition of their mobile operating system, iOS 6. The big features added to iOS 6 include Siri support on the new iPad, a new Apple maps app (iMaps? 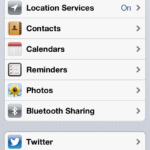 ), OS-level Facebook sharing, an app called Passbook, and a few other things. The news is generally welcome. The verdict is still out on whether the new Apple Maps app will have transit directions. As to be expected, very few sources are reporting on this. Some places say yes, many many places are silent. Of course, the fallback will be using Google Maps in the browser. Another feature that is very welcome is the addition of per-account signatures for each of your email addresses. And, for educational use, I’m welcoming the new Guided Access feature, which will enable device administrators (e.g. parents or teachers) to lock down their device so only one app may run. A theme that emerged at today’s WWDC keynote — and made very evident by the launch of the latest MacBook Pro (you know, the one with the Retina Display) — was that it’s time to look forward in technology and leave some technologies behind. If you have the first iPad, you won’t be able to upgrade to iOS 6. Likewise, only the fourth generation of iPod touch will be the only iPod touch that can get the iOS 6 upgrade. The iPhone 4 and iPhone 4S are also upgradeable…and so is the iPhone 3GS, announced at WWDC three years ago.